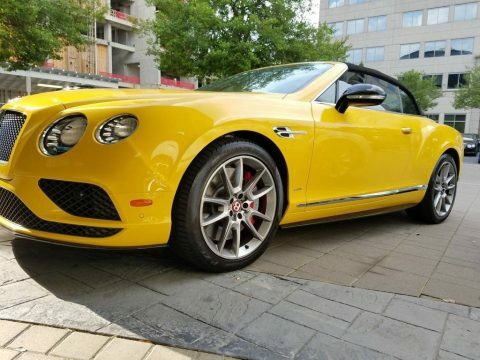 2016 Bentley Continental GT V8 S Convertible For Sale in Houston, Texas 77008 Get ready for the ultimate driving experience with this 2016 Bentley Continental GT V8 S Convertible. This personal luxury car features a sleek, stately styling that is dressed in an upgraded color combination of Continental Yellow complemented by an exceptionally clean black leather interior. Powered by a 4 liter twin-turbo charged V-8 engine that is mated with 8-speed automatic transmission, this handsome devil offers 520 horsepower and a readiness to hit the road. With only 4,500 miles you can rest assured that this charming convertible will be on the road for many years to come! This Continental GT V8 S offers the ideal combination of performance and curb appeal. Highlights of its advantages include almost every option imaginable, including heated/ventilated seats with massage features, neck vent, yellow contrast stitching, sport exhaust, sport suspension, 20-inch upgraded rims, and metal footware. However, don't let this Bentley's dashing good looks and innovative design quality fool you - this car is not for the faint of heart. This is the first year that the GTC had a more squared off, macho front end with a bigger grill, and side vents in the fenders; all of which is sure to command attention while on the road. For your listening pleasure this Bentley has been outfitted with a premium audio sound system complete with CD changer. This 2016 Bentley Continental GT V8 S Convertible has been meticulously maintained. It has never been smoked in and always garage kept, which has enabled its like-new condition. Additionally, you can easily keep this Bentley running like new because it is still covered under the original manufacturer's warranty. Perfect for anyone who enjoys living life in the fast lane! Don't miss out on this amazing opportunity because this Bentley is competitively priced well below its true value. Call today for more information on how you can get behind the wheel of this unparalleled Continental GT V8 S Convertible!! !